This guidance is for service providers or government departments who install networking technologies in government shared buildings, known as hub buildings. You must follow this guidance if you are refurbishing an existing office space, building new office space or moving to a hub building. Refer to the Government Property Agency (GPA), part of the Office of Government Property (OGP) for more details on the Government Hubs programme. You must only allow authorised and authenticated devices to access network management interfaces. Also, make sure devices are set up to encrypt their data traffic or that encryption occurs at the entry point to a network rather than on the network. The diagram shows an example of installing a shared internet link. It shows the internet coming through two ISP routers to create an internet VLAN. Then there are two firewall options shown, a shared firewall and a department firewall. The shared firewall links to wifi and a departmental VLAN. 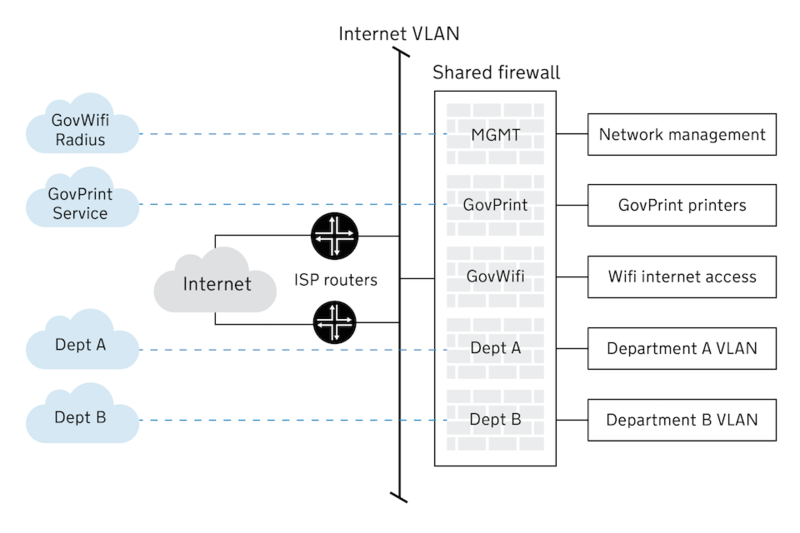 The department firewall links straight to a separate departmental VLAN. Connect two highly available firewalls to the internet link. This helps to prevent a single point of failure on your network. You can use virtual systems to separate services from each other, and from general system management. This reduces the scope of the changes you’ll need to make when adjusting the configuration of each virtual network’s own firewall context. The diagram shows an example of a firewall design for a shared building. 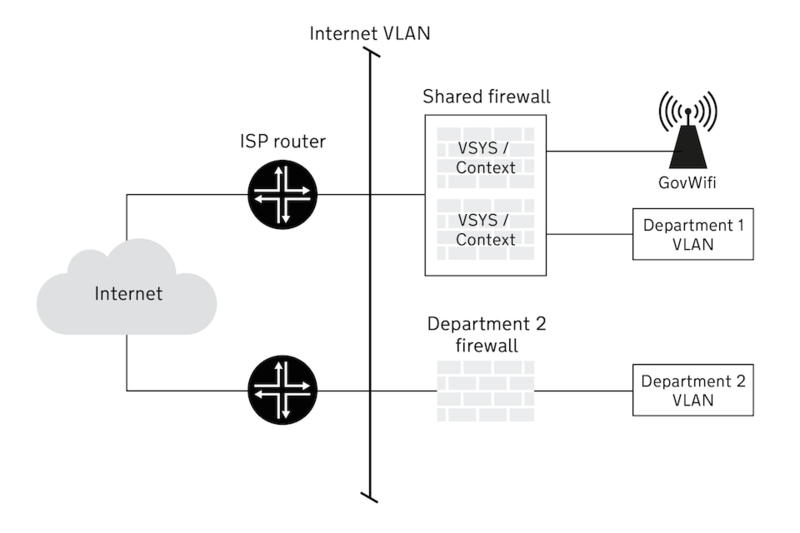 It shows how services and departments in the cloud connect via the internet VLAN through a shared firewall to the services in the building. It also shows how the internet comes through ISP routers to create the internet VLAN. 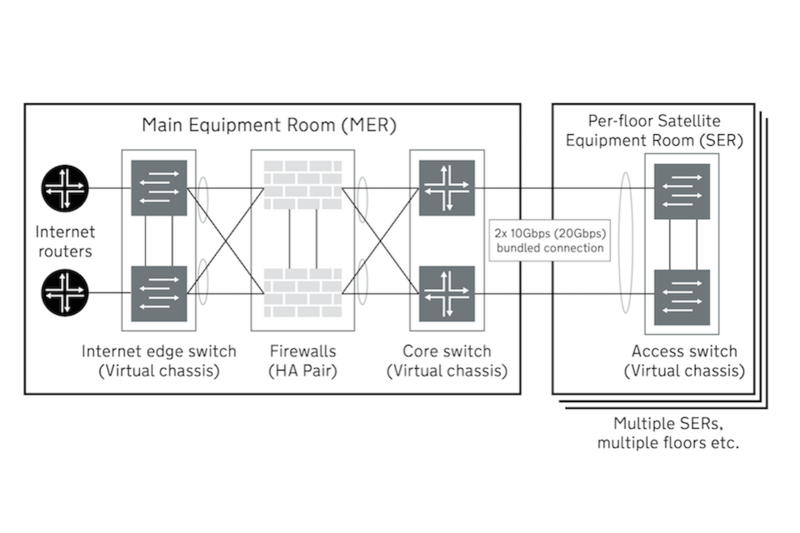 You can mitigate against device failure when using high availability firewalls by making sure the capacity of the remaining equipment exceeds the maximum required to run the building. Do not depend on Active/Active to provide the minimum throughput capacity for a building. The maximums must exceed the anticipated number of connected devices to the network. This applies to both firewalls and switches. Most modern firewalls support the cryptographic standards for using IPsec to protect data, set by the National Cyber Security Centre (NCSC). You should buy any extra licensing your chosen firewall vendor may need. You should use dual stack network interfaces that work with both IPv4 and IPv6 addresses. The industry standard for IPv6 network allocation (/56 for a building/location and /64 per VLAN) provides enough capacity for an occupier’s connected devices, and extra capacity for privacy addresses. Use stateless address auto-configuration (SLAAC) on network devices configured for IPv6. SLAAC is a service where the Layer 3 device (firewall, router or switch) advertises its addressing capabilities. SLAAC is the interface that connects to a broadcast domain via router advertisements (RA). There is a limit to the amount of information available in RA packets sent to the all-nodes multicast address. This limit is the recursive DNS server (RDNSS) information. The open standard RFC8106, and Windows 10 in the 2017 Creators Update, supports the RDNSS feature. It’s common for organisations to use RFC1918 addresses in 10.0.0.0/8 or 172.16.0.0/12 for their internal networks. When you provide IP subnets to guest networks, use the 192.168.0.0/16 range for address space. This will prevent overlaps or conflicts when devices use VPNs to connect back to their organisational networks. When using additional guest isolation concepts, it’s common practice to provide a 192.168.0.0/18 (16,384 addresses) or 192.168.0.0/17 (32,768 addresses) subnet allocation to the guest network. You should use a Domain Name System (DNS) proxy on the firewall and forward all traffic to the NCSC Public Sector DNS service. You should consider blocking all other outbound DNS traffic that is not directed at the local DNS proxy. There is no need for you to run separate DNS/DHCP servers in the building as the dedicated network devices (for example, core routers) you select should support running DNS and DHCP services. Modern firewalls can use virtual systems to separate data traffic and the configuration of the firewall. The local area network (LAN) should meet the capacity needs of your users. It should follow the network vendor’s best practice. The diagram is an example of a LAN physical topology in a shared building. It shows the main equipment room with internet routers, internet edge switch, firewalls and core switch. The diagram also shows how these link together and to the satellite equipment room with access switches. Two models provide different benefits or constraints for distributed or controller-based traffic routing. Distributed routing has more flexible architecture and is the recommended option. 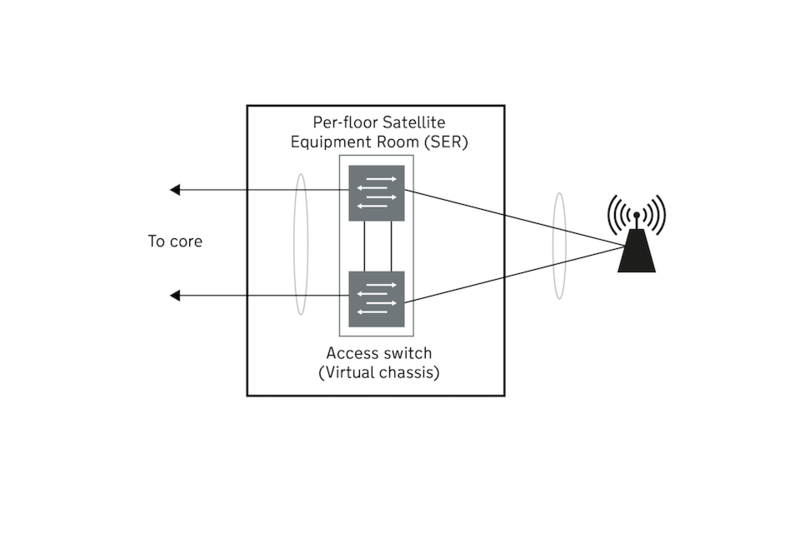 Distributed routing (or local breakout) uses the access points to send the data traffic from any connected device to the local switch on the correct VLAN. The benefits are that you have a reduced chance of network slowdown, and an increase in the network’s scalability. The constraints are that you will need to do more configuration on the access switches to extend any access VLANs across the building. You must make sure the core switch stack at the centre of the network has enough capacity for the anticipated bandwidth use in the building. Create a stack on each switch using high bandwidth links and configure them so you can manage them as one. The core switches must also connect at least 2 links to all access switches. There are 4,096 virtual local area networks (VLANs) available, which should be enough for the number of networks required in the building. Be aware that smaller switches support fewer VLANs with a variable limit of about 64 active VLANs. You are not required to use physical switches to separate organisation’s traffic. VLANs separate different organisation’s traffic on a shared Layer 2 switched network. When subnets use an access port setup to receive pre-assigned VLANs, you must make sure that the size of the subnet can accommodate the anticipated number of connected devices. Using PVLANs makes sure that devices are protected from malware as they are not at risk from probing by other users’ machines. You should install PVLANs on network equipment. You must put devices that need to communicate, such as meeting room audio and visual, in the same PVLAN community. Most modern switches support a basic automatic Quality of Service (QoS) configuration. If you use an automatic QoS configuration you should consider that QoS tags in a shared building are rarely supported across the internet. You may find exceptions when the internet service provider has a separate service element that supports a VoIP (voice over internet protocol) service. You will need to enable multicast on your network to support items such as meeting room technologies or network-connected TVs. Large buildings with core and multiple access switches will have a distributed switch setup. In this situation, you may need to setup an IGMP Querier for each VLAN that requires multicast. To manage and monitor network equipment and devices you should provide a dedicated VLAN and network range. For example, store the network credentials in a bastion host or jump box away from regular workstations and work email access. You should follow the zero trust network model as outlined in the section ‘Installing your network’. You can also restrict emergency access used through console over IP servers to emergency out-of-band networks that provide physical access controls from trusted networks through an IPsec VPN. Log administrative access to network devices and record any commands in the logging system. You can use the separation of roles and responsibilities to make sure administrator accounts do not have access to both the network management interfaces and the logging system. Where this is not possible, those individual administrators should separate accounts with different passwords and 2FA tokens. Most modern network devices support free open source configuration management tools. You can use these to configure network devices in a structured and repeatable pattern. This allows you to detect unexpected configuration changes made against your recorded baseline. You should regularly backup your network device configuration if you are not using automation tools. Make sure you record any configuration changes against approved change control events. Use the Network Time Protocol (NTP) to configure network devices. To do this you can either use a central NTP server run by the service provider, or an internet-based NTP server. Use the NTP to keep accurate security logs and synchronise data across devices. The wireless network must meet the capacity needs of the building and follow the network vendor’s best practice. The diagram is an example of the topology for building a wifi network in a shared building. It shows the satellite equipment room with access switches and links to the core equipment and wifi. For staff areas, you will need to use 2.4GHz and 5GHz from at least 2 access points (APs) to provide enough coverage. Areas of the building used by facilities management may still need wifi, but this can be at a lower density. The access points you use should be capable of operating in both 2.4GHz and 5GHz bandwidths. This will give you 2 radio transmitters on each AP and provide better coverage for your wifi. In areas with high density usage, you should alternate the configuration of the devices so that every second AP is set up with both radios operating at 5GHz and the others as dual 2.4GHz and 5GHz. Make sure you enable a dynamic frequency selection (DFS) on the radios so they can use more of the 5GHz bands. Configure the channel width to 20MHz, 40MHz, 80MHz or 160MHz. The wider the channel the more throughput a wireless client can get from the access point. However, this reduces the number of clear frequencies an AP can use against neighbouring APs. For high density office deployments, 20MHz or even 40MHz is enough. Adjust the radio power specifications based on density and occupancy. Most enterprise APs have 2 ethernet ports. One is generally used for Power over Ethernet (PoE) and the second is for data only. Together they provide enough bandwidth for you to fully use the radios. Configure the AP with an aggregated ethernet connection to provide a 2Gbps link. This can be faster if the AP and switch support 2.5GBASE-T or 5GBASE-T ethernet. Users (staff or guests) should use wifi to access the network, but you should also provide a wired ethernet connection as an alternative. You should use the GovWifi authentication service to install GovWifi SSID and authenticate users. To help protect your network, use the LAN to install an 802.1x policy. This policy means the default action is to give an unauthenticated user internet only access by placing the port on the same VLAN as GovWifi. When you need to configure devices with an 802.1x policy, check if this policy is turned on by default. If it is, check if you need to set the credentials as well. When 802.1x is not required you must turn it off for the device to function. It is important to test all devices before going ‘live’ in a building. If you cannot use certificates to authenticate devices then you should configure your fixed access ports or use MAC authentication. Document the certificates and authentication and monitor the network for changes in link status or MAC addresses connecting to the port. In the event of suspicious activity the monitoring system should generate an alert. Where devices are not portable, use an ethernet cable to connect them to the network. This includes CCTV systems, building access control systems, meeting room devices, printers and fixed computer workstations. Printers, TVs and other network accessories often do not have authentication certificates. In these cases, it’s up to the hosting organisation to decide whether they make an exception to allow open ports or MAC authentication. Where the device only requires wired (with PoE) internet access, use the default 802.1x profile. When you need a VLAN ID it is the hosting organisation’s responsibility to select it. You should make sure that VLAN IDs are appropriate for the ranges used by the building’s IT system. There are no plans to create a central list of allocated VLANs for corporate networks across hub buildings. When you provide devices with access to legacy or corporate networks, you can use a fixed-open switch port on the correct VLAN or a MAC list to assign the correct VLAN. Please email hubs-phase-2@digital.cabinet-office.gov.uk for more information.